You'll be £16.99 closer to your next £10.00 credit when you purchase John Barry. What's this? Order within the next 4 hours, 32 minutes to get your order processed the next working day! 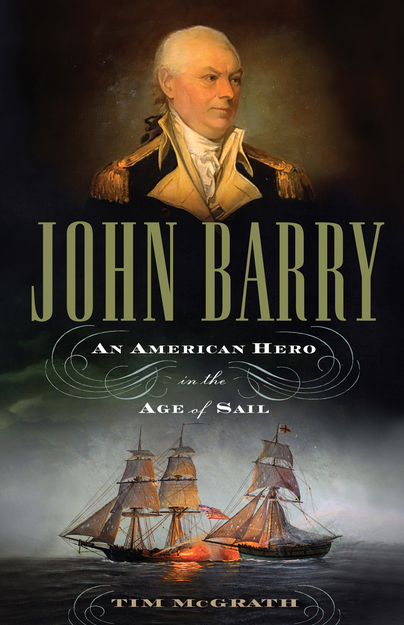 John Barry: An American Hero in the Age of Sail is the first comprehensive biography of this legendary officer in over seventy years. Son of a hardscrabble Irish farmer from County Wexford, Barry was sent to sea as a child and arrived in Philadelphia during the restless decade before the American Revolution. Volunteering to fight for the Continental cause, Captain Barry captured the first enemy warship taken by a Continental vessel and fought the last battle of the American Revolution, a successful engagement off Florida. With peace came a historic voyage to China, where Barry helped open trade with that reclusive empire. President George Washington named Barry as the first commissioned officer in the new United States Navy In 1794. Drawn from primary source documents from around the world, John Barry by Tim McGrath is an exciting and masterful biography of one of America’s most distinguished heroes. John Barry is a book that anyone interested in the Continental Navy or the early Federal Navy will want on their bookshelf. Tim MacGrath is to be commended for a fresh and detailed look at an often-overlooked American naval hero. TIM McGRATH is an executive in a Philadelphia area firm. His articles have appeared in Naval History magazine.